It may be surprising to hear that aftermath of flooding from hurricanes or heavy rains can be just as damaging if not more so than the actual storm itself. Anyone who has never experienced a major flood might not understand just how dangerous flood waters can be after a storm hits and what kinds of threats they have to your safety and health beyond water damage to your home. Here are a few of the main ways that flood waters can be deadly. Any kind of stagnant water can collect bacteria. However, if this stagnant water has been rushing through uncontrolled sources like sewers, garbage treatment plants, etc., it can have a lot more bad bacteria growing in it than a typical river or lake. In places like Panama City, the threat is even greater for bacteria because the water and weather are so warm that flood waters can become a perfect habitat for any germs to grow in. If you have experienced a flood, never come in contact with the flood water without the proper gear if you can help it. Initially when the flood begins, and there is water rushing everywhere, debris can be a huge problem. Flood water is almost always very dirty and not easy to see through. This combined with the fact that it has been wrecking havoc on the surroundings means that there are probably a lot of harmful things in the water. Even when you are trying to get away from the water in a hurry, try to be wary of what water you walk through and what shoes you are wearing. Try to wear heavy duty boots while you are getting to safety so you don’t end up stepping on debris and injuring yourself or contracting tetanus. Another danger of traveling through flood water is electrocution. If there are downed power lines or if your home has experienced flood damage, there is a high chance that electrocution is a real threat. Before you enter a home that has flood damage, make sure you turn the electricity off at the breaker or call your utility company to have it cut off. You never want to enter a home that has a live charge and water on the floor. Similar to electrocution, if you have your gas on when you enter your home and there are any sparks from any source, you could have fire damage along with your water damage. Make sure you have your gas shut off before you enter a home and that it is cleared for entering before you go in. If you have a gas leak from damage surrounding your home, it could be deadly. 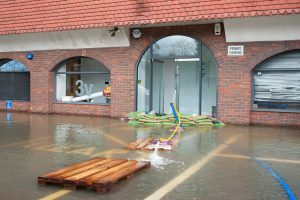 If you have experienced water damage from flood waters or storms, you should call a professional from Daystar Cleaning immediately. Flood water can be very dangerous, especially to people who do not have the right equipment or training to deal with it. If you are unsure of your home being safe, do not enter it; instead, call a professional.